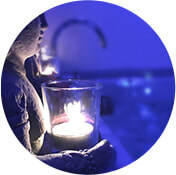 The hot tub with hydro massage massage function or only bubble bath is heated on 37 °C. Bathtub is efficiently aluminated by led lights for perfect relaxation. The water is checked daily according to valid pH and Cl regulations. You may find here a leather sofa is placed in the rooms witch can be extended to double bed, a privite bathroom with hairdryer. 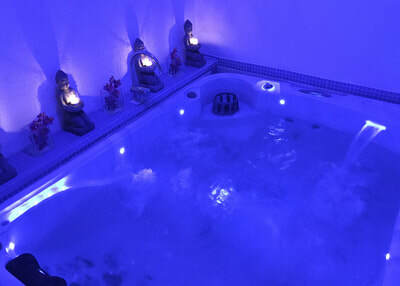 The entire premises are pleasantly aluminated in blue as well as a the hot tub. Whole premises are separate from the salon and are lockable. Everything what you may need is ready for you: One small and one big towel per person, toiletries, fan etc. ​You may purchase slippers at the reception for 50 CZK and additional towell for 100 CZK. Coffee and tea are offered at the entrance. Water is prepared for you free of charge in the Wellness area. You may cancel your wellness reservation more then 8 hours before the due. After that you will be charged cancellation fee. When entering Wellness we will require a deposit of 1000 CZK. 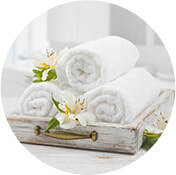 In case of returning wellness messy, water impurizing or any damage the deposit wont be refounded. 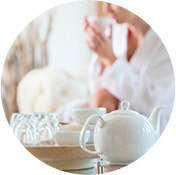 For Wellness is required payment in advance, through credit top up. Do we get some time for preparation? 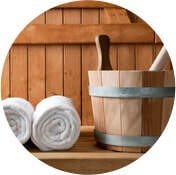 The reserved time for private wellness is understood as a rental time of premises for the booked time. If you need more time, you need to order it in advance. You can order even 30 minutes after minimum an hour. Can we bring own alcohol? Unfortunately, no. If you wish, you can order a romantic package with a bottle of sparkling wine. Can we regulate the temperature in wellness? 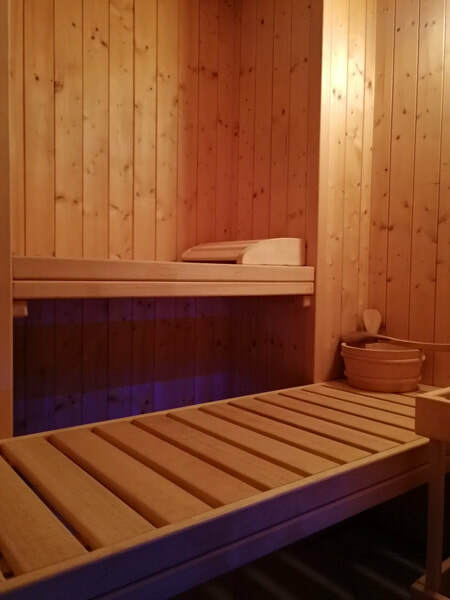 Yes, the sauna has its own control and a ventilation system is installed on the premises. If this is not enough, there is a window that can be opened. Can i combine off pick and pick hours in one visit? Yes, in the on-line system, you enter an hour off-peak and continue ordering at the peak time. In Extra time you can book only 90 min. intervals. Yes, you get the keys and no one will disturb you. Please remember that the hot tub switched off every hour and if you want to turn it on again, you must call our employee at the reception.